The minutes from the most recent FOMC meeting were released on Wednesday, and it revealed mostly what we already knew. The Fed doesn’t see the need to raise or lower rates at this time. Even though investors pretty much knew this, the market rallied after the release. 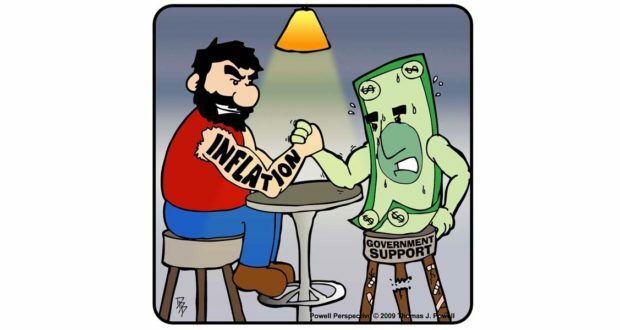 One of the reasons the Fed felt comfortable pausing the rate hikes from last year was that inflation had essentially hit its target last year, but “it was noteworthy that it had not shown greater signs of firming in response,” according to the minutes. President Trump and a few other officials have been calling for a cut in rates, but the FOMC has made it clear that it won’t cave to political pressure to determine the rate path. Most of the content in the minutes was known and shouldn’t have surprised anyone, but investors took it as a positive report. There wasn’t really any bad news or good news in the minutes. In another article for Bull Market Rodeo published earlier this month, I pointed out how investors were possibly viewing bad news as good for the market because it would keep the Fed in the dovish stance. Investors also seem to be ignoring a couple of reports from this week that could be bad news for the market. The Consumer Price Index was released on Wednesday, and it showed prices at the consumer level rose by 0.4% in March and that was higher than the estimates and it was higher than the 0.2% increase in February. The CPI was flat in November, December, and January. The annualized rate for CPI for the 12-month period that ended in March was 1.9%. The Fed’s inflation target is 2%. With the jump in CPI in March, the Fed’s inflation target is seemingly being met. This means the likelihood of a cut is very minimal at this time. The other side of the inflation equation was released on Thursday and the Producer Price Index showed prices at the producer level jumped 0.6% in March. That was also higher than the estimates and higher than the 0.1% increase in February. The PPI showed 0.1% declines in December and January and another 0.1% increase in November. The overall PPI for the 12-month period ending in March was 2.2%. The annualized rate for the 12-month period that ended in February was 1.9%. These figures are also in line with the Fed’s target inflation rate. Here’s what surprises me—if the FOMC minutes were a positive for the market, why aren’t the CPI and PPI reports bad news for the market? And in reality, they aren’t bad news—they simply show that inflation is in check and that the Fed is in a comfortable place with rates. There isn’t any need to lower rates and there isn’t a need to raise rates. I guess what it boils down to is perception. Each person perceives news with a slight bias based on their own beliefs. I was reminded of this earlier this week when I was looking for the info on the NFIB Optimism Index. 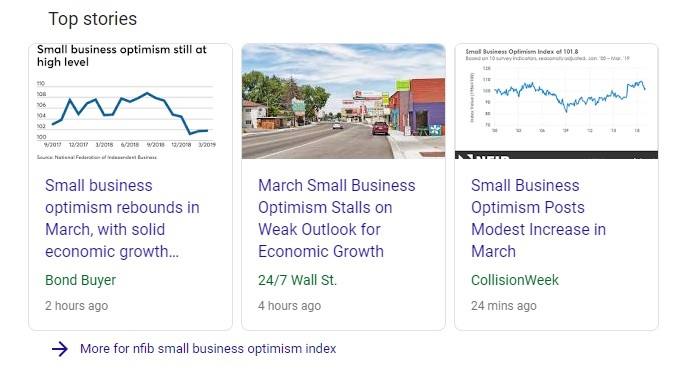 When I entered “NFIB Optimism Index” into my search engine, the following image is what I saw. Look at the headlines from these three different sources. The first one says the index rebounded and showed solid growth. The second one says the index stalled on a weak outlook for growth. The third one is probably the most neutral and says it like it really is—there was a modest increase in the index in March. Investors are perceiving news based on their own bias. That can be a dangerous thing to do. I would encourage you to view the news with as little bias as possible when it comes to making investments.